The U.S. Air Force must make better use of its spacecapabilities to support warfighters on the ground and in the air, according tothe outgoing commander of the Air Force Space Command. Better space capabilities can build on existing satellitesand other assets rather than just launching more into Earth's crowdedspace lanes, said General C. Robert Kehler. 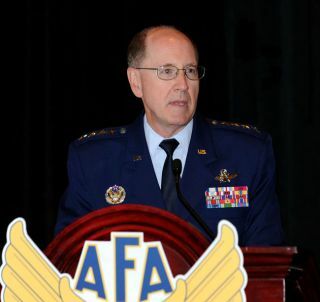 The general spoke during the Air Force Association's recent Air& Space Conference and Technology Exposition held in Oxon Hill, Maryland onSept. 14. One example of using existing assets comes from shufflingaround the Global Positioning System's satellites, so that GPS users on theground get better coverage whether walking between city buildings or in thecanyons of Afghanistan. "This way we are taking advantage of those satellitesthat are already on orbit but repositioning them in a way that has realoperational benefit," Kehler explained. The Air Force already began repositioning some GPSsatellites a year ago, as part of a process expected to take 12 to 18months and boost overall coverage. Kehler also pointed out that the Air Force already knowswhat space systems it will have 10 to 20 years from now, given the long delayinvolving development and deployment. Such systems "are leaving the launchpads today," he added. For instance, a new advancedcommunications satellite that launched in August was meant to ensure openlines between the president, military commanders and troops on the battlefieldeven during all-out nuclear war. But a propulsionglitch meant that Air Force controllers had to devise a new way to raiseits orbit slowly, delaying operations by six or seven months. Space Command also needs to integrate better within the AirForce's air and cyberspace domains, Kehler suggested. But he warned that no onestrategy would work for every mission that requires space capabilities. "We need to bring innovation when thinking of thosestrategies. We cannot abandon innovation to avoid risk," Kehler said.